SANTA BARBARA — A local business’s request to add guided standup paddleboard (SUP) tours to its waterfront offerings in Santa Barbara Harbor was unanimously approved by harbor commissioners at their Jan. 22 meeting. Amid early concerns of congestion in the harbor, the Santa Barbara Harbor Commission ultimately found a middle ground with Santa Barbara Adventure Co., which sought to offer guided SUP tours to its customers. Santa Barbara Adventure Co. already offers kayak tours to Channel Islands, among other outdoor excursions. Santa Barbara Waterfront Director Scott Reidman said a compromise was reached with Santa Barbara Adventure Co. owner Michael Cohen to launch and land the guided SUP tours at West Beach instead of the boat launch ramp. “The use of West Beach for launching and landing the tours in the quiet water area, instead of the launch ramp fairway, really satisfies staff concerns with adding to the congestion in the launch ramp fairway, which has a mixture of rental craft [and] large dive boats,” Reidman said. Michael Cohen, who owns and operates Santa Barbara Adventure Co., initially made the SUP request in October 2014 but was denied by city staff because of concerns of congestion and safety in the launch ramp area. The Santa Barbara Harbor Business Activity Permit Committee discussed the issue Dec. 16, 2014, but failed to come to a resolution. However, the committee heard the issue again at its Jan. 6 meeting and recommended the Harbor Commission accept the compromise reached between Cohen and city staff. Beyond congestion and safety concerns, city staff did not believe the use of SUPs was the same as kayaking. According to Cohen, industry insiders view SUPs and kayaks as similar uses. “Although it is not exactly the same, it is similar or a variety of kayaking,” Cohen told commissioners. Nuances aside, city staff and harbor commissioners believed having the guided SUP tours launch from and land at West Beach would not create additional congestion in Santa Barbara Harbor. “[We did] acknowledge guided SUP tours have less potential impact on harbor congestion than rental and privately owned SUPs,” Reidman told commissioners. Cohen agreed, adding West Beach was his preferred location to launch and land. Santa Barbara Adventure Co. limits its guided SUP tours to eight people per trip, though Reidman said between four and five people, on average, participated in the tours in 2014. Cohen said guided SUP tours are a safer alternative to renting out personal watercraft to individuals. “I do think guided trips are safer. We’re only going to be doing guided trips. We carry radios and have trained staff,” Cohen said. 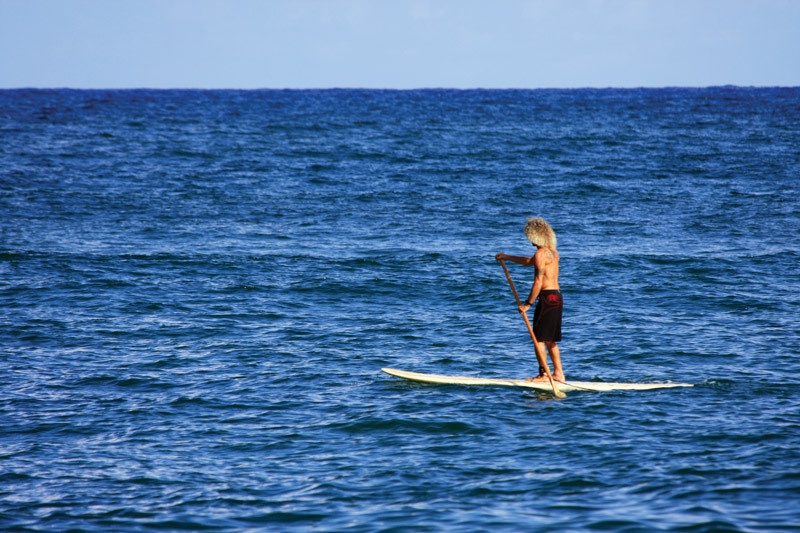 Santa Barbara Adventure Co. began offering guided SUP tours in 2013. Last year, city staff advised the company to cease offering SUP tours. Cohen complied before making a formal request to the city to be allowed to resume tours. In addition to agreeing to launch and land at West Beach, Cohen agreed to pay a fee of $250 per year for SUP excursions; Santa Barbara Adventure Co. is already paying an annual $250 fee for kayak excursions.